We’ve heard the heartbreaking stories of a sleep-deprived parent, a hot car, an infant and a mistake that will haunt them for the rest of their life. We read the headlines of how another child lost their life after being left in an oppressively hot vehicle and shake our heads in dismay; we swear it would never happen to us. The reality is that non-traffic child/car-related deaths are not limited to a child’s being left unattended in a vehicle. There are many dangers when it comes to kids and cars, but there are also steps we can all take to eliminate fatal outcomes. According the non-profit KidsandCars.org, roughly 2,400 child or infant deaths occur each year from non-traffic related accidents. Non-traffic incidents are injuries or deaths that occur in or around a vehicle; but take place off public roads or highways, mainly in parking lots or driveways. These incidents include, backovers, frontovers, heat stroke, power window strangulation or amputation, vehicles inadvertently knocked into gear, trunk entrapment, seat belt strangulation and underage drivers. Luckily, those statistics are on the decline thanks to legislation and increased public awareness, but there is still work to be done. One positive step occurred in 2017 when the HOT CARS (Helping Overcome Trauma for Children Alone in Rear Seats) Act became a critical piece of legislation that would prevent children from being needlessly killed and injured when left alone in vehicles. But there are also steps that each parent or caregiver can take daily to form the habits that increase family safety. The Look Before You Lock mantra is being shared in the form of education cards for new parents that have been distributed to hospitals and birthing centers nationwide to help educate parents at the beginning of their child’s life. Parents who have ever been sleep-deprived know that their brains switch to auto-pilot and they virtually sleepwalk through their day. 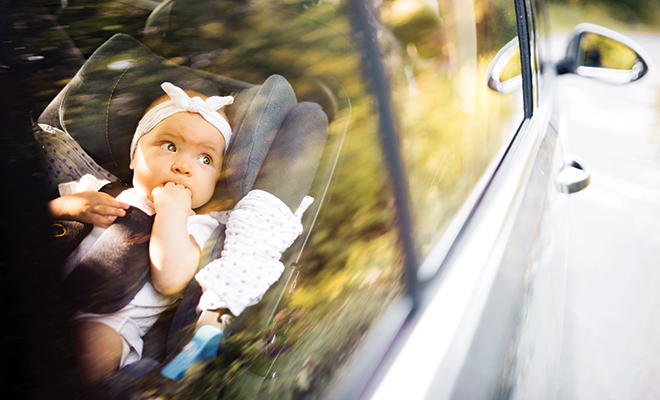 Leaving necessary and valuable items such as purses or briefcases in the backseat next to their sleeping child can jar memories and prevent fatal mistakes. Other suggestions are to leave a stuffed animal in the car seat and place it in the front after strapping the child in the car seat. Parents are advised that keys and remote openers should never be left within reach of children, and doors should be locked at all times. According to 2007 data from the National Highway Traffic Safety Administration, backover accidents account for around 42 percent of all non-traffic related auto fatalities involving children each year and frontovers account for another 22 percent. Sadly, most of the time it’s a relative behind the wheel, often a parent, who runs the child over with the family vehicle. Be aware of the location of your non-passenger children. When backing out of or entering a driveway or garage, take note where the child is at all times. The reality is that kids are low to the ground and many of today’s vehicles are large enough to have blind spots on all four sides. Have someone else hold infants or toddlers and have younger children stand in a safe zone, such as a front step or inside a porch, to make sure they are in eyesight at all times. As soon as young ones are old enough to walk and talk, explain to them how important it is to never run after Mom or Dad when they are driving to or away from home. They also need to understand Stop on Red; when Mom or Dad’s car taillights turn red, that mean the car is about to move and they need to run to another adult or to a designated safe zone. New cars are equipped with backup safety systems, and older cars can be retrofitted with visual and audio backup sensors. They’re not foolproof; do a walkaround to make sure there are no kids around or under the car, where the camera will not see them. It may be tempting to leave a child inside a car for a brief time while you’re running errands. One word of advice: don’t. A child could get up and climb around or even pretend to drive, possibly dislodging the gear from park, subjecting the car to rolling into traffic and being struck by another vehicle. A simple strategy is to always use the emergency brake; it’s another good habit to develop. Sources: keepyourchildsafe.org, kidsandcars.org and washingtonpost.com.